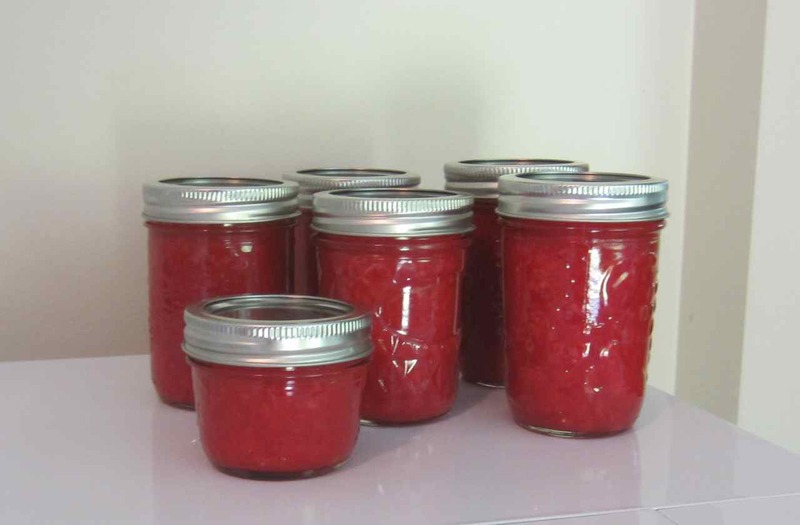 After the first batch of jam I used some of the rhubarb I’d gathered from a neighbours yard to make a rhubarb concentrate (a.k.a. a rhubarb ribena, ergo christened rhubina). Don’t worry, I asked the neighbour first, about taking the rhubarb. Turns out she and her husband hate rhubarb so she told me to take as much as I wanted. Oh yeah, baby! 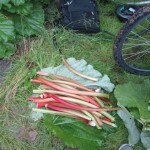 Rhubarb patch AFTER I harvested. 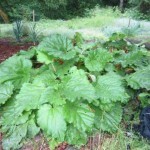 That’s a LOT of rhubarb. Note: The rhubina is very tasty. I filled a large Dutch oven with diced rhubarb, added water just to cover and boiled it for a while. Then I let it cool a bit, strained it with a medium fine sieve, put it back on the stove, added a cup of organic cane sugar, and brought it to a boil. I didn’t want to over-sweeten as I still like a hint of the tartness that makes rhubarb awesome. To drink I cut it 1:1 with club soda; a friend added a shot of vodka and gave it an enthusiastic two thumbs up. Mmmmm. My next project was strawberry mango jam because, well, mangoes were on special. And they are delicious. Strawberries are in season, so readily available. Tada! This time I tried the Bernardin No Sugar Pectin because I wanted to reduce the amount of sugar required even further. 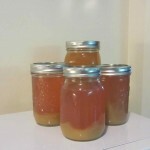 As I am experimenting, I tried it with 1 cup of organic cane sugar, a third of the first recipe I used. After the fact I discovered that the label should be “No Additional Sugar Needed Pectin” because while I didn’t have to add any sugar there is already quite a lot of it, in the form of dextrose, in this Bernardin product. If mangoes are delicious fresh, and delicious with strawberries in jam, then I bet they are delicious in jam all by themselves. As it happens, they are. 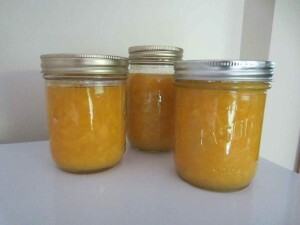 My third batch was plain ol’ mango jam. I used the Bernardin No Sugar Pectin again, but this time added no sugar because mangoes are a tropical fruit and come fully loaded with plenty of sweetness. 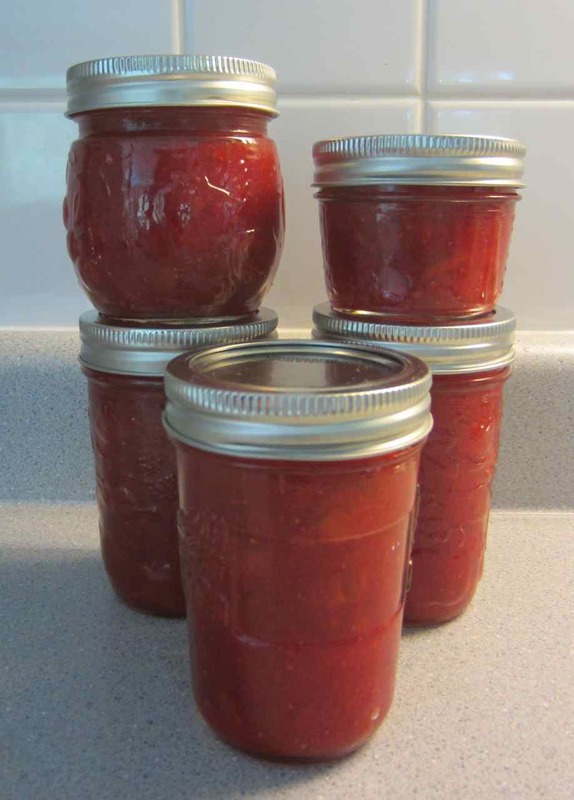 Having no sugar in jam means it will can perfectly well, but will have to be used within a few short weeks once it’s opened, even stored in the fridge. Sugar acts as a preservative so the trade-off of not adding any is a shortened shelf life once the seal is broken. Well that was fun! And I’ve learned a lot about making jam. I guess maybe now is the time to confess that I don’t eat a lot of bread or bread type products, therefore I don’t really eat a lot of jam. So…guess what you’re getting for your birthday? And Christmas. *PS: Did you know rhubarb is technically a vegetable but is classified legally as a fruit? Who knew?